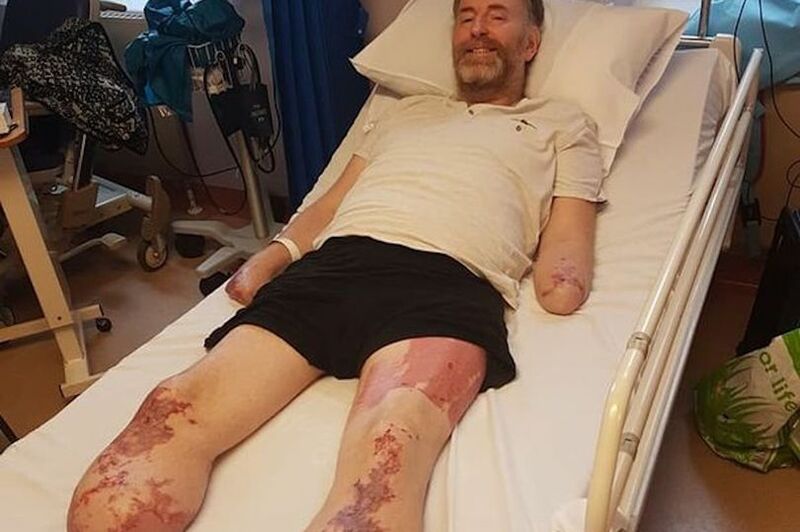 A father-of-three had to have both his legs and most of his hands amputated in order to save his life after falling ill with what he thought was a cold. 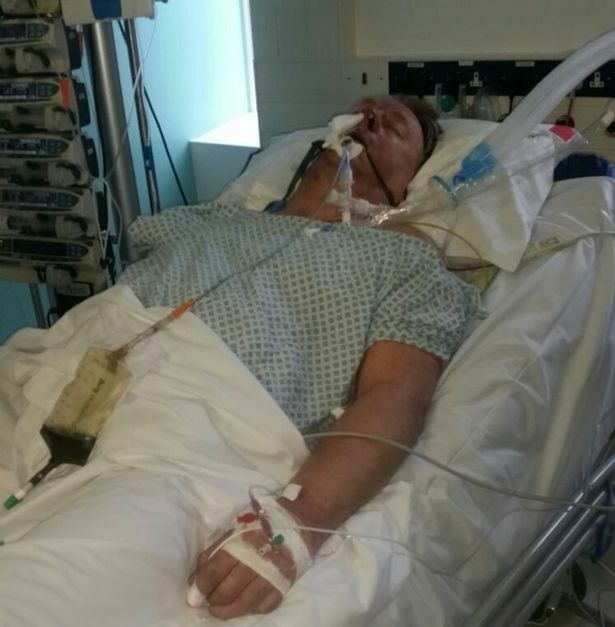 Chris Garlick, 46, was stunned to learn he had contracted sepsis , which causes his immune system to attack the body's tissue and organs. Just hours after calling NHS Direct he was fighting for his life, WalesOnline reports. Chris lost both legs, one of his hands and all the fingers on the other hand. His wife Karran was told he was going to die, he revealed. Despite now facing having to learn how to live an entirely different life, Chris says he is full of gratitude to the doctors who saved his life, and Karran for her support. Massage therapist Chris, whose children are aged 10, eight and five, said: “To watch what my wife has gone through; I’m just so grateful. It was Saturday, July 15, when Chris, who runs a chiropractic clinic in Cardiff alongside Karran, first began complaining of cold and flu-like symptoms. By Sunday, he felt so unwell he was confined to his bed at home. Karran, 41, returned to the bedroom a while later and found he was running a high temperature, but he was so weak he was unable to get into the bath to cool off. Karran had recently started a training course with a view to returning to nursing and recognised some of Chris’ symptoms. 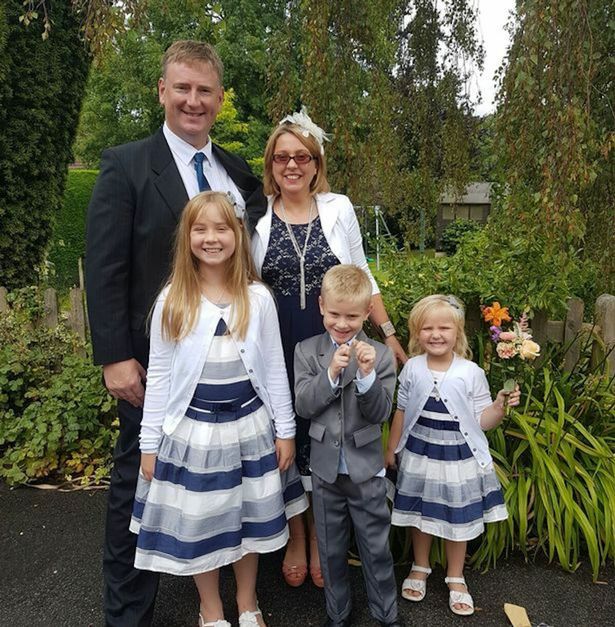 She telephoned NHS Direct and after allowing the operator to hear Chris’ laboured breathing down the line, an ambulance was immediately dispatched to their home. 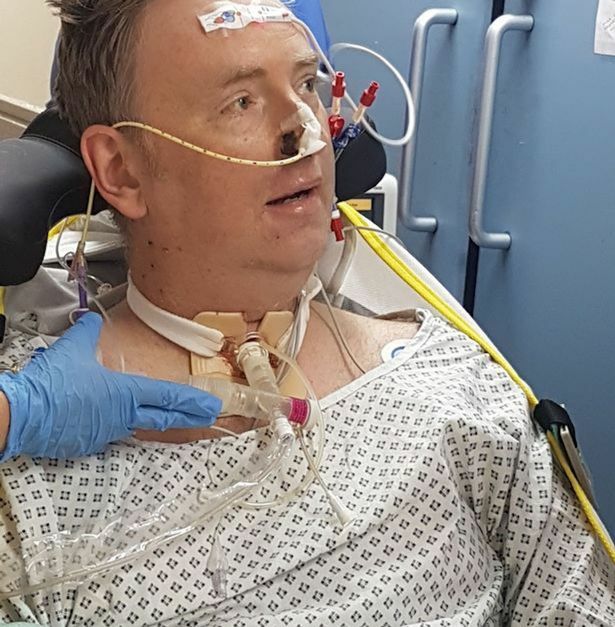 Chris was taken to the intensive care unit at the Royal Gwent Hospital in Newport, where he was placed on assisted breathing apparatus and given a blanket course of antibiotics. During the first night, Chris had to be resuscitated. His condition eventually stabilised, but he remained in a coma for a further fortnight. Karran said doctors discovered Chris had contracted meningococcal bacteria, which led to the septic reaction. Sepsis is a life-threatening condition that arises when the body’s response to infection causes injury to its own tissues and organs. It is most commonly caused by bacterial infection. “His lungs had stopped working, his heart wasn’t working too well and his clotting wasn’t working so he was bleeding everywhere,” Karran said. A build up of dead tissue, known as necrotic tissue, around Chris’ limbs was found to be causing strain on his body. Chris was visited by a surgical consultant, who broke the news to the couple that he would have to amputate below the knee on both legs. 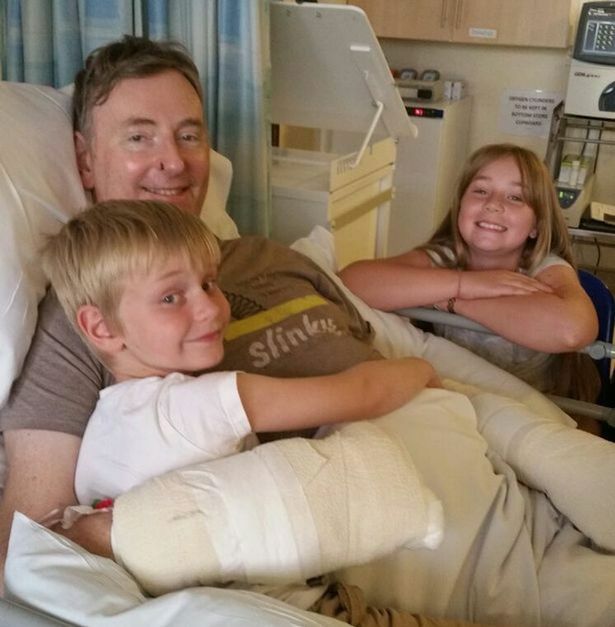 On August 30, the day of his daughter’s tenth birthday, Chris went into surgery to have his legs amputated, as well as his left arm above the wrist but below the elbow at Morriston Hospital in Swansea. Surgeons were able to save the palm of his right hand and his thumb. Chris said: “I pleaded with him to save everything he could and he did. I’m very grateful for that. “When you think about all the tiny, miniscule things like buttering toast or typing on a key board that you just take for granted,” he added. “Once you don’t have that it’s incredibly painful. In the intervening seven weeks, Chris made faster progress with his recovery than doctors initially estimated. 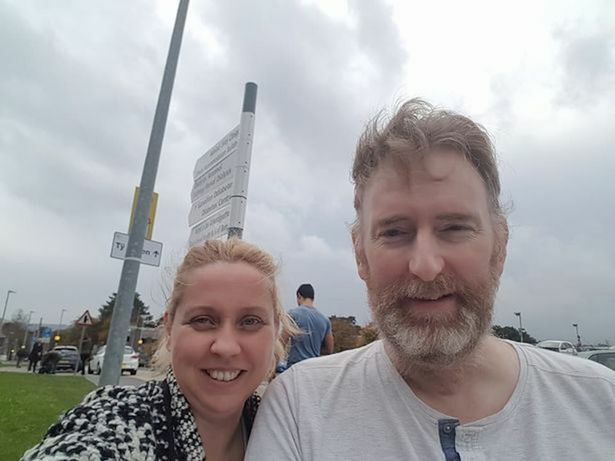 He says he wants to be able to return home for Christmas and hopes he will soon be moved to Rookwood Hospital in Cardiff to begin more intensive rehabilitation. Dr Ron Daniels BEM, Chief Executive of the UK Sepsis Trust, said: “Stories like Chris’s remind us of the devastating human cost of sepsis. Every day in the UK, individuals and families have their lives torn apart by the condition, but better awareness could save thousands of lives each year. A Just Giving page set up during the summer raised £2,000 to help support the family while Karran and Chris have been unable to work. With extensive renovation needed to adapt their home for Chris’ needs in future, another Just Giving campaign has been set up. A coffee morning which took place on Saturday October 21 has also been organised to raise money to support the family.